The 5th World Carrom Championship, from 13th to 17thfebruary at the beautiful city of Cannes, France has been successful in many respect. 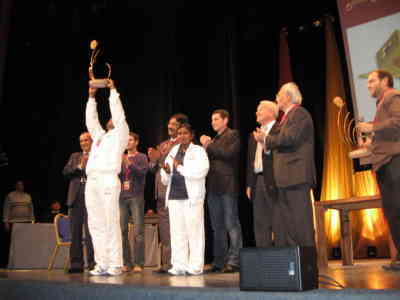 While the 5th World Championship was inaugurated on 13th February by ICF President Arif Naqvi and Secretary General S.K.Sharma the prizes were given at the closing ceremonies by the Mayor of Cannes and ICF President Arif Naqvi and Secretary General S.K.Sharma on 17th February, who also thanked the members of the French Carrom Federation for organizing the World Championship so successfully and praised the work of the Chief Referee Mrs. Rohini Mathiasz, Technical Director P. Raveendran, Assistant Chief Referee V.D. Narayan and other umpires for conducting the matches verry smoothly and successfully. At the same time it was a pity that the Carrom players of some countries could not participate in the World Championship due visa and other technical problems. However the World Championship at Cannes created much enthusiasm among the players and officials who are now looking forward to the ICF Cup 2008, which will be held in November at Colombo, Sri Lanka.